THE SUMMER SEASON MAY BE COMING TO A CLOSE, BUT THE FUN DOESN'T HAVE TO END. The Santa Barbara Triathlon, established in 1981, is one of the longest-running independently owned triathlons in the world. Stunning scenery and an oceanfront finish line ensure a sellout event every year. Promote your health and wellness as you run/walk beside the sparkling water. Every finisher gets a free t-shirt, a medal, and lunch. What a perfect way to kick off your Friday morning! Switch up your daily routine and participate in a silent yoga session on the beach. Not only will you release some endorphins, but you'll get to listen to the soothing ocean as background noise. You will surely leave in an elevated mood. Enjoy a free showing of The Iron Giant, an animated adaptation of Ted Hughes’ Cold War fable, on the beautiful grounds of the Santa Barbara County Courthouse. Grab some snacks, some blankets, and a group of loved ones for a cozy Friday night! Beautiful Santa Barbara County Courthouse. The building is a walk in history and panoramic views await at the clock tower. Definitely worth a visit when you’re in town. Attend this concert dedicated to Santa Barbara's rise above tragedy. Witness more than 200 musicians convey a message of hope for only $10. 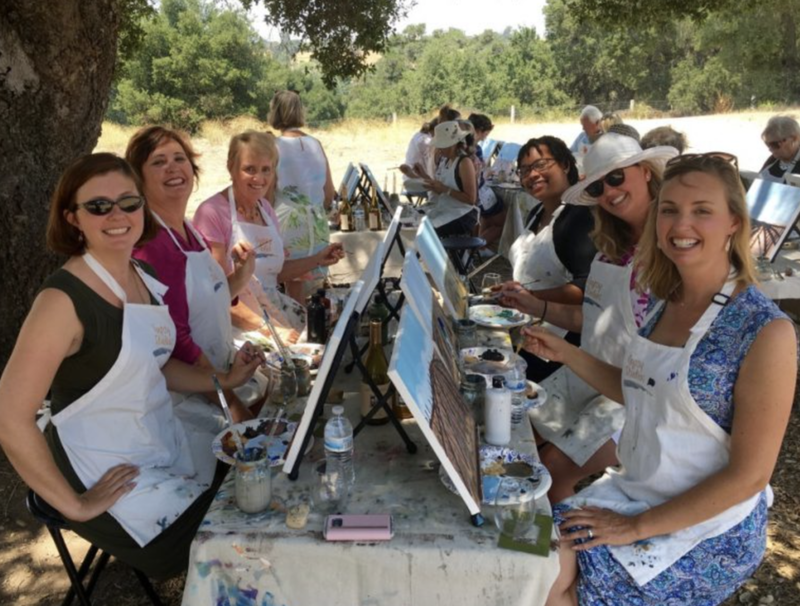 Release your stress and get creative at Sanford Winery. The beautiful valley and expansive vineyard provide a stress-free environment that will inspire your creative spirit. No matter what your painting skills are, you will be amazed by what you can create with a little instruction from a professional. Spend your Sunday afternoon at a semi-final polo match. General Admission tickets start at $12. There is a variety of seating options including Grandstand and Luxury Cabanas. After the match, head to the clubhouse for the after-party. Sip wine as you enjoy the sunset aboard the Double Dolphin. A representative from Santa Barbara Winery will be on board to pour the tastings and provide information about their selection. Meanwhile, the Captain will give insight about the scenery. Enjoy an Apertivo Bar featuring Aperol Spritz, Negroni, and Italian red and white wines. An arrangement of house made bites perfect an already delightful evening. Some of the appetizers included are fried cheese olives, dalla forma pasta (prepared in Pecorino cheese wheel), and Cicchetti Veneziani, which is traditional Venetian fare. Experience a luxurious food and wine pairing with ocean views and live music. Foley Food and Wine Society will showcase premier wines from North and Central Coast wineries. The wines will be paired with fresh, locally sourced seafood. There will also be a dessert bar.